CERN experiment: Earth in Black Hole? Doomsday is big favourite with science fiction writers, film-makers and religious believers. There are endless gruesome ways that the world could end; through nasty, natural disasters or because of some man-made abomination. From maniac killer robots and super volcanoes to an alien invasion and mutant psycho humans, all options are covered in Discovery's '10 ways the world will end' 1 9.20 | 2 9.21 | 3 9.25 | 4 9.21 | 5 9.23 (YouTube). 5 scientific experiments to end the world (Cracked.com) | 5 ways to destroy the earth (Intechnology.org) | Top 10 ways to destroy the Earth (LiveScience) | How to destroy the earth (Things of interest) | Machines that destroy the earth (Popular Science, 1946) | Doomsday Clock (Wikipedia) | Doomsday Clock Timeline (Bulletin of the Atomic Scientists) | Soon (Abhota.info) | World Deception part 3 (Chemlin) Series of 36 parts (at YouTube) that "will make you understand why some of our top emotional feelings plays a large role in our life, why we have this fear of certain things" | Don't think that will be easy (Mopo.ca). Even Donald Duck is fascinated by the final catastrophe (Xandernieuws, Dutch) > English (Google Translation). Item (June 7, 2009) at Dutch website XanderNieuws - Een Xander perspectief op het wereldnieuws, where the anonymous writer shows a critical (neo conservative?, religious right?) and illustrative view at world events. One of the chapters is Endtime and Prophecy. Translation? Google Translate. It is for 100% certain the Earth will end and humanity will disappear. It is only not certain when and how. In Exit Mundi, a Dutch based site of science journalist Maarten Keulemans, dozens of scientific analyses and theories of apocalyptic scenarios are discussed. Of each possible catastrofe you find the impact, the human survival chance and the probability that it happens. The result is a very informative website stocked with worst case scenarios, scientifically founded and humoristic described, from the threat of melting ice caps to the coming ice age (!). Click any item and find out all kind of details about incoming meteors, weird physical events, odd burps of the cosmos, pollution, pole shift or the black holes, apocalypse, nuclear war or the religious apocalypse. And more. In a book (in Dutch language) Keulemans modifies: the future is not so dark as prophecied by religious fundamentalists, end time believers and several scientists tell us: live is going on first one million years. What could happen when an asteroid hits the earth? See this of impressive large impact simulation (YouTube, Japanese spoken). (1) Space rock 'on colission course' (BBC July 24, 2002) after the observation of asteroid 2002 NT7 on an impact course with Earth, to strike the planet on February 1, 2019. (2) Animation of NASA for asteroid 2002 NT7 February 1, 2019. Click link for demonstration. (3) Animation at target=_blank>NASA Near Earth Object Program showing asteroid 2004 MN4 approaching the Earth in April 2029. No, there is no danger of a sudden impact of an astroid of meteor on Earth. All alerts are cancelled. However: March 2, 2009, asteroid 2009 DD45 passed the Earth at a distance of about 48,800 miles (78.000 km). A rock with a diameter of 154 feet (45 meters), about the same as the asteroid that exploded over Siberia in 1908 and leveled more than 800 square miles of forest. 2009 DD45 was discovered February 27 (movie at link), only three days before, one million miles (1,6 mln km) away. March 18, 2004, asteroid 2004 FH, about 30 metres (100 feet) in diameter, passed approximately 43,000 kilometers (26,500 miles) above the earth's surface (nearly ten times closer than the Moon), and set a new record for closest recorded approach. A smaller one, FU 162 (10 meter across), passed Earth March 31, 2004, at an altitude of only about 6500 km. Most threatening at the Torino Scale, categorizing the impact hazard associated with near-Earth objects (NEOs), is asteroid 2004 MN4 (about 450 metres (1,500 ft), now called 99942 Apophis). 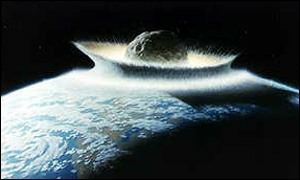 December 2004 it caused concern because initial observations indicated a significant probability (up to 2.7%) that it would strike the Earth in 2029 (level 4 at Torino). Later observations that reduced to level 0, but the gravity swing when 99942 Aphoses nears earth in 2029 gives a new calculation of 1 to 45,000 at April 13, 2036. Video: Apophis 99942: The Killer Asteroid of 2036 (YouTube). and the formidable Judge will judge his people. This is the last 'motto' of Saint Malachy (1094-1148) the Irish Archbishop of Armagh. In St. Malachy's Prophecy of the Popes (Catholic-pages.com) he attributed a vision of the identity of the last 112 Popes. Benedict XVI (2005-...), the 267th pope of the Roman Catholic Church, is number 111 in the list! < Saint Malachy prophecied Petrus Romanus, successor of pope 'Gloria olivae' (Benedict XVI), to be the last pope ever. Ninehundred years ago St. Malachy called his 111th pope 'Gloria olivae'. In 2005, after the death of John Paul II, Joseph Ratzinger from Germany was chosen and called himself Benedict XVI. The Catholic Pages explain with some prudence: "The Benedictine order traditionally said this Pope would come from their order, since a branch of the Benedictine order is called the Olivetans. St. Benedict is said to have prophesied that before the end of the world, a member of his order would be Pope and would triumphantly lead the Church in its fight against evil. While the Holy Father chose the name "Benedict", this does not seem enough to fulfil the prophecy. Nor is it clear how Benedict XVI (a Bavarian) is "Glory of the Olives". Since he is said to have remarked in the Conclave after saying he would take the name Benedict that it was partly to honour Benedict XV, a pope of peace and reconciliation, perhaps Benedict XVI will be a peacemaker in the Church or in the World, and thus carry the olive branch". The last motto has no number in the Malachy prophecy, but the pope has a name: Petrus Romanus. The 'motto' prospects tribulations, the destruction of Rome and the Last Judgement. The predictions end with 'Finis'; The End. It is easy to conclude: the End of the World is near. True? The Wikipedia item Prophecy of the Popes provides all kind of details about the prophecies of Saint Malachy and last 111 popes. Maybe it is wise to scroll down to the chapter 'Authenticity and Skepticism'. Since the beginning of recorded time, people have been thinking about the end of the world and making predictions about how and when it might happen. Doomsday forecasters now have focused on the year 2012 (Beyond 2012 headquarters). Citing the conclusion of a lengthy cycle in the ancient Mayan calendar, certain theorists anticipate the end of life as we know it on December 21, 2012. These theorists believe that on December 21, 2012, the Earth will experience unprecedented, cataclysmic disasters ranging from massive earthquakes and tsunamis to nuclear reactor meltdowns. Until that day arrives - if it arrives - people no doubt will continue to speculate endlessly about how and when it will all be over. Mayan Calendar (animated) >. Click illustration for original calendar. The accumulative time until December 21, 2012 is given and you can calculate the Mayan date for any date of your own choise. The Mayans, probably the best-known of the classical civilizations of Mesoamerica, had a very precise understanding of our solar system's cycles. They believed that these cycles coincided with our spiritual and collective consciousness. Based on their observations, the Mayans predicted that from the initial date of the start of their civilization, 3113 B.C., after one cycle being completed 5,125 years in their future, December 21st, 2012. We are living today in the cusp of the Mayan end times, the end of a galactic day or time period spanning thousands of years. The Great Cycle of the Mayan Long Count calendar ends on the winter solstice of 2012 A.D.: December 21. Following Mayan concepts of cyclic time and World Age transitions, this is as much about beginnings as endings. In fact, it was considered by the ancient Mayans to signify the creation of a new World Age. Detailed documentation in Mayan End Time Prophecy 12-21-2012 (Adishakto.com). Mission of the Institute for Human Continuity (IHC) is 'to ensure the survival of the human race beyond 2012'. 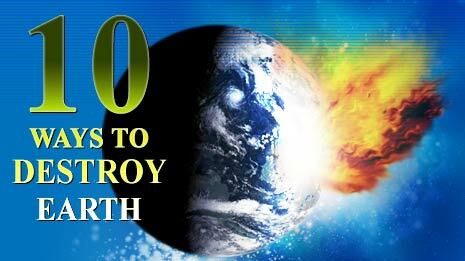 The IHC's comprehensive research has confirmed with 94% certanty that in the year 2012 cataclysmic forces will decimate our planet and much of its inhabitants. "We at the IHC believe it is our duty to do what we can do to prepare. The IHC has brought together the world's foremost scientists, politicians and business leaders to ensure the survival of humanism beyond 2012." Googling you find out the institute is prepared for the < announcement of '2012'. Despite the many theories and religious interpretations, the only thing certain is that December 21, 2012 the Winter Solstice occurs in the northern hemisphere at 11:11 UT. The Sun is at its lowest point in the sky and it will be the shortest day of the year. This is also the first day of winter. The planet�s major religions each have their own beliefs about the end of the world, the triumph of good over evil and Judgment Day. In Christianity, the Book of Revelation, the last chapter of the Bible�s New Testament, mentions Armageddon, the final battle on Earth between the forces of God and Satan. In Islam, the end of the world is referred to as the Hour and involves Jesus returning to Damascus to slay an anti-Christ who has put the planet in peril. With the anti-Christ out of the picture, a period of perfect harmony will ensue. In Judaism, there is no term for Armageddon, but there are references in the Hebrew bible to events that could be compared with Armageddon, including the Day of the Lord (in which God causes death and destruction to people who deserve to be punished) and the War of Gog and Magog (in which Israel and its god fight their enemies, rather than an anti-Christ). In Hinduism, there is the story of the god Vishnu coming back in the last cycle of time as a figure called Kulki, who rides a white horse, carries a sword that looks like a comet and destroys the forces of evil. In some Buddhist prophecies, the equivalent of Armageddon is Shambhala, in which good triumphs over evil; however, the planet is restored rather than destroyed so people can pursue enlightenment. When the world was exited that the atomic bomb had made an end to the world with Japan (and so the Second |World War), W.D. 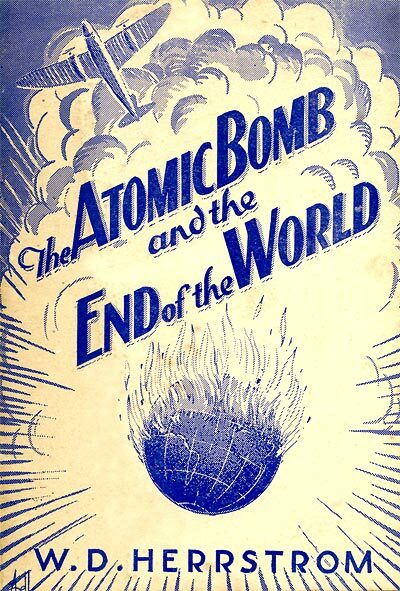 Herrstrom, a self-proclaimed "world traveler and prophetic analyst" (and  denying the holocaust) warned in The Atomic Bomb and the End of the World > (1945) that God predated the Bomb and that the Apocalypse will be on His time table and no one else's. If you are 'saved', the Lord will take you out of the world before that final war takes place. I myself wrote in 1999 an article about the American Waiting for the return of Jesus (Google translation of Wachten op de Wederkomst). Endtime: NEW DATE: October 21, 2011 (Wecanknow.com) > Judgement Day: May 21, 2011.